Voting in a tense election to choose a new government in Bangladesh ended on Sunday with at least 13 people being killed in poll-related violence amid allegations of manipulations by the ruling Awami League led by Prime Minister Sheikh Hasina. 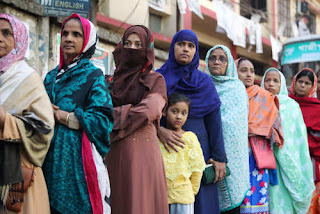 The results would be announced within 24 hours Prime Minister Sheikh Hasina appeared as the first voter in Dhaka centre from where her nephew and party candidate Fazle Nur Taposh was a contender. "I'm always confident about our victory in the elections... I trust my people and I know that they will choose us so that they can get a better life in future," she said after casting her vote. Meanwhile, violence marred the polling in parts of the country with media reports putting the death toll at 11. Dozens of people were wounded in the poll-related violence. According to the Daily Star newspaper, BNP men attacked and killed an Awami League supporter in Mohonpur, Rajshahi-3. One Oikyafront supporter was killed in Chandina in police firing. A voter died during tension between supporters of the Awami League and the BNP in Dinajpur-2. An activist of Bangladesh Chhatra League was killed in clashes with the BNP activists in Cox's Bazar-1. "From the picture we have received, this is a violent election. We are seeing a one-sided election environment conducted at the whims of the government. This paints a clear picture that they want to ensure a favourable result through a one-sided contest," Rizvi told a media briefing at the party office. "Every minute I receive calls saying ‘Kamal Bhai (brother), it has already happened overnight. It began in the evening. I have gotten so many reports. These reports are concerning. It's sad and shameful," he said. The polls are being held at 40,183 polling stations. Voting was suspended in one seat due to the death of a candidate. Zia, serving a 10-year prison term on graft charges, has been barred from contesting the polls while Rahman is living in London.